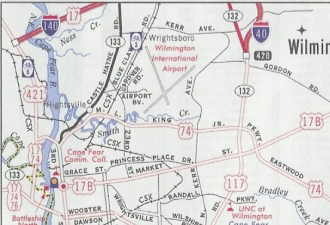 US 17 Business #1: Born in 1960 as a renumbering of US 17-A through Elizabeth City. It has not changed its routing along Eringhaus and Road Sts. The northern half is duplexed with US 158. 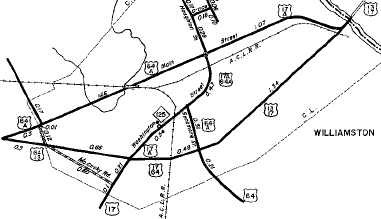 When the current US 17 Bypass was built well west of town, US 17 Business was not extended in either direction. Instead a US 17 with no banner was assigned. US 17 Business west of town was original NC 342 while north of town it was part of NC 34. US 17 Business replaces 17A. US 17 Business #2: Born in 1960 as a renumbering of US 17-A in Williamston, running on Washington St and Main St. 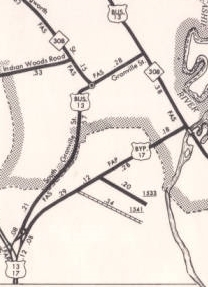 In Oct 1969 (NCDOT), US 17 Bus-NC 125 was put on one-way splits south of Main St. Southbound was an upgrade to SR 1436. In Sept 2003 (NCDOT), US 17 Business was extended south replacing some of mainline US 17 which was moved onto the new US 13-64 freeway. NC 125 is duplexed on US 17 Business from US 64-A into downtown and has been since the beginning. US 17 Business was the original NC 30. US 17 Business #4: Born in 1961 as a renumbering of mainline US 17 in Vanceboro, running on Main St. 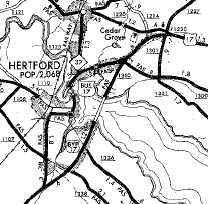 US 17 Business #5: Born in 1966 as a renumbering of mainline US 17 in Hertford, running on Dobb St. and Church St.
NC 37 is now duplexed on the northern half of US 17 Business, but in the beginning was on the southern half. The southern half of US 17 Business was the original NC 342. US 17 Business #6: Born in Aug 1971 (NCDOT) as rejuvenated primary routing in Wilmington. Ran on 3rd St north of Wooster/Dawson, then east on Market to 16th/17th. 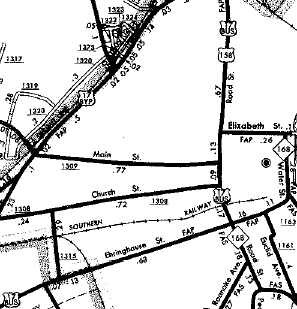 Up until 1969, 3rd St was mainline US 421 and Market St was mainline US 17-74-76. 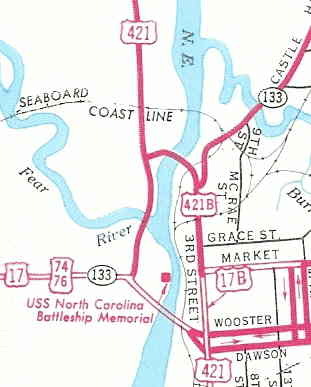 In July 2006 (NCDOT), US 17 Business was extended in both directions: west across the Cape Fear River bridge to meet with the relocated US 17-74 by the Battleship Memorial; northeast replacing mainline US 17 on Market St out to the Pender County line area. In May 2017 (NCDOT), US 17 Business was truncated on both ends - south back to its original end in downtown Wilmington and north to Military Cutoff and Ocean Highway. In both cases the rescinded segments were replaced by mainline US 17. 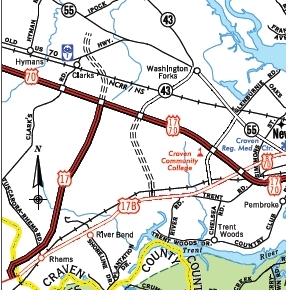 US 17 Business is parts of original NC 60 and NC 30. US 17 Business #7: Born in Aug 1977 (NCDOT) as a renumbering of mainline US 17 in Edenton. Ran on W. Queen St, Broad St and E. Church St.
NC 32 has a brief duplex with US 17 Business. 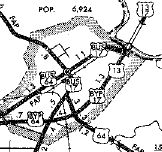 In Dec 1996 (NCDOT), US 17 Business was rerouted to use NC 32 from the bypass to downtown. West Queen St became SR 1204. 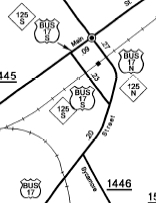 In April 1998 (oer May 2012 NCDOT document), US 17 Business was restored to W. Queen St. US 17 Business is part of original NC 342. US 17 Business #8: Born about 1985 as a renumbering of mainline US 17 in South Mills. Runs on Main St. US 17 Business runs under the US 17 Dismal Swamp Canal bridge without access to US 17. NC 343 has a duplex with the northern half of US 17 Business. US 17 Business is part of original NC 341. US 17 Business #9: Born July 1991 (NCDOT) as a renumbering of mainline US 17 in Bolivia. Runs on Old Ocean Hwy. US 17 Business is part of original NC 201. 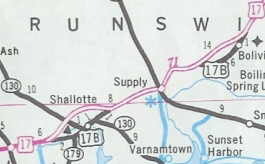 US 17 Business #10: Born Aug 1992 (NCDOT) as a renumbering of mainline US 17 in Shalotte. Runs on Main St. The northern half of US 17 Business is duplexed with NC 130. US 17 Business is part of original NC 30. US 17 Business #11: Born in Nov 2006 (NCDOT) as a renumbering of mainline US 17 in Jacksonville. Runs on Marine Blvd. NC 24 Bus has a duplex with the southern half of US 17 Business. US 17 Business #12: Born in mid-2008 as a renumbering of mainline US 17 in Windsor. Runs on King St and "Bypass 17". NC 308 has a brief duplex with US 17 Business. The King St portion of US 17 Business is part of original NC 30. This is the 2nd distinct US 17 Business to exist in Windsor. US 17 Business #13: Born in Feb 2011 (NCDOT) when US 17 was placed on a bypass east of Chocowinity and west of Washington. The business and bypass routes cross with no access a little south of the Tar River. 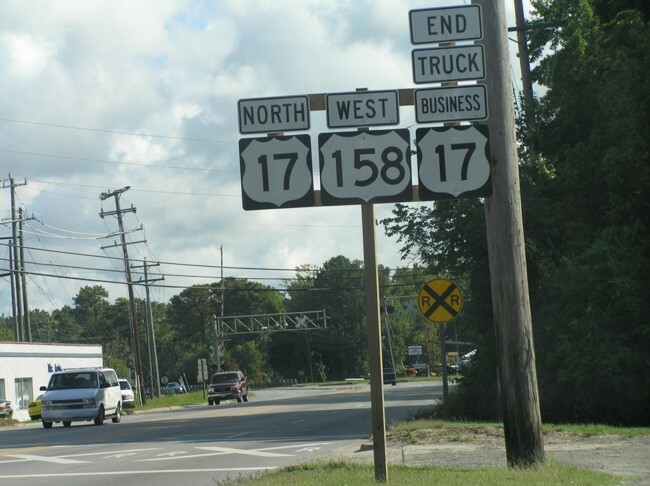 US 17 Business #14: Born in July 2011 (NCDOT) when US 17 was placed on a bypass west of Rhems and suburban New Bern. 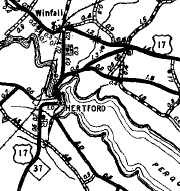 US 17 Business #3: Created in 1960 as a renumbering of US 17-A through Windsor. It used today's US 13 Bus from the south then headed out east on NC 308. 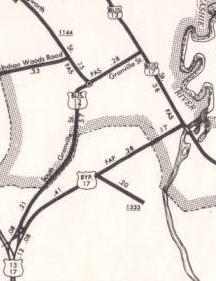 Mainline US 17 used "Bypass 17" which is now part of the current US 17 Business. 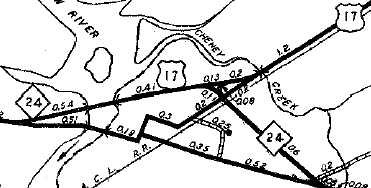 In April 1976 (NCDOT), US 17 Business was removed, leaving behind US 13 Bus and NC 308.